In this podcast, College Station Neighborhood Services Coordinator Barbara Moore discusses the challenges of her role in a fast-growing university city. She also explains why beavers cause her issues and why she sees herself as an ambassador for the city. Since 1999, Neighborhood Services has helped strengthen and support College Station’s homeowner and neighborhood associations through a variety of programs and services, including gateway and neighborhood grants. Neighborhood and homeowner associations registered through the city’s Neighborhood Partnership Program have long been able to apply for grant funding for entrance signs and other beautification projects. More recently, smaller, less expensive projects have become eligible, leading to the Strong and Sustainable Grant Program. These programs have brought a sense of identity, community and beautification to many of our neighborhoods. We’re proud to have played a role in a wide array of projects that have brought neighbors together and are still serving their purposes years later. The grant programs are even more vital today as our neighborhoods continue to grow. To me, the best thing about National Night Out is just seeing neighbors having open discussions about the things that affect their neighborhoods — and what they can do to make those neighborhoods better. As a witness to many National Night Out celebrations through the years, I can attest to the collaborative spirit these events can produce. The cities of College Station and Bryan will observe the 29th National Night Out on Tuesday with numerous block parties and celebrations designed to bring residents and local law enforcement together. College Station police officers answer questions and provide insight and information about crime prevention and ways to build safer neighborhoods. Residents will also likely cross paths with city officials such as the mayor, city council members and city managers. In College Station, at least 40 neighborhoods participate each year, many for the first time, forging strong relationships and discovering the power of unified neighborhoods. With National Night Out as a starting point, neighbors begin talking more frequently about concerns and issues, and work together to resolve those problems. These neighborhood groups often evolve into a strong neighborhood organization that develops a true sense of community. Mosquitoes beware: Bobby is on the loose! The City of College Station is taking an aggressive approach to battling local mosquito populations. In addition to distributing mosquito dunks to homeowner and neighborghood associations, city crews are performing spot spraying and placing their own dunks in areas of heavy infestations. Much of that responsibility falls on Drainage Maintenance Crew Leader Bobby Engledow, a longtime city employee who was out bright and early this morning spraying a drainage culvert that runs between homes on South Rayado and Arroyo courts. Looks like a fun job, doesn’t it? But think of all the pesky (and potentially dangerous) mosquitoes that are no longer around. 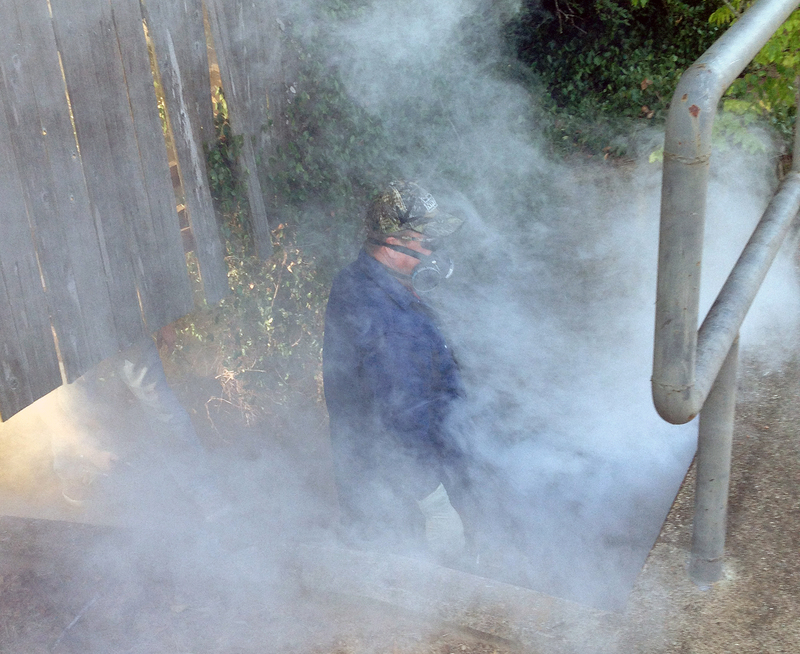 For more information on the city’s mosquito abatement program, read the recent blog by Neighborhood Services Coordinator Barbara Moore. Click here to learn more about West NileVirus. Why Should You Give a Hoot about SeeClickFix? Since the City of College Station began using SeeClickFix for citizens to report code enforcement and public works issues, hundreds of issues have been successfully resolved. And of the 143 cases reported through the online application in 2011, most were resolved within a week. However, a successful resolution doesn’t always mean fulfilling the request – at least not immediately. 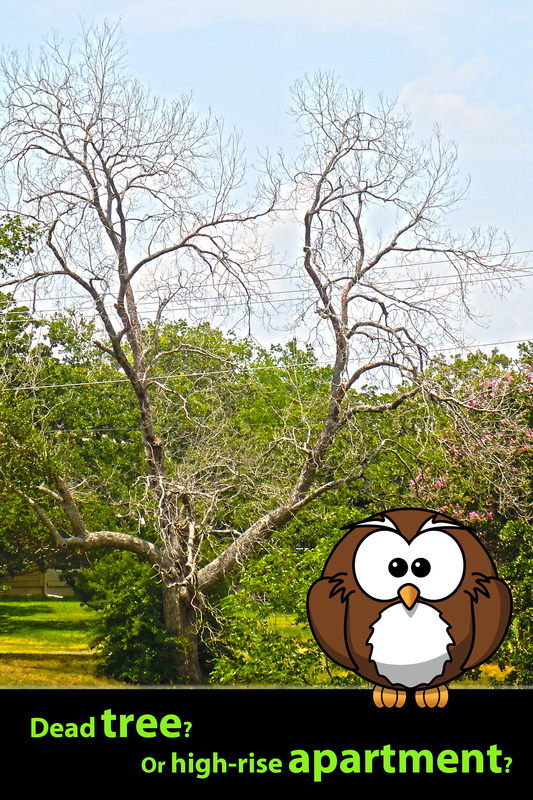 A few weeks ago, a resident used SeeClickFix to request the removal of a diseased tree in Brison Park. The next day, a Parks and Recreation Department crew discovered that a large limb had fallen off the sick tree, revealing a partially hollow interior. A peek inside revealed that the tree may have been hollow, but it was certainly not empty. A family of owls had taken up residence and seemed to be doing quite well, thank you. Displacing the young family from its cozy home wasn’t an attractive option, so the soft-hearted city crew chose to leave the shabby tree – and its feathered occupants – alone for now. When the resident learned why his request would not be resolved, he chuckled and said we’d hear no more “screeching and hooting” about it from him. HOAs are Subject to Open Records Requests? Last year, the Texas Legislature passed a number of sweeping laws that are having a significant impact on how homeowners associations operate. The new laws require greater compliance with state regulations than before, and many HOAs were not fully prepared to deal with those changes. Since College Station has more than 60 HOAs, it was important for us to identify established experts to help educate our HOAs about what this all means to them. Texas Community Association Advocates is a statewide advocacy group that represents HOAs and the interests of association communities in the legislative process. Through the TCAA, we found experts who were willing to help our HOAs prepare for the changes, which took effect Jan. 1. In late February, Sandy Denton, past president of the TCAA, and Marc Markel, a real estate and property rights attorney, presented in-depth information to about 80 representatives of our local HOAs.